"I was born in Cumberland, MD on July 29, 1951 and raised by my mom until the age of 6 when she passed away. My maternal grandmother Mary Frazier raised me from that point with the help of my paternal aunt Marion Simms. Through out my youth the neighborhood playground "Pine Ave" played an important part in my development. It was here that I learned to interact with people through games, contests, social events, group discussions, etc.. The playground leader Jean Beckward, through her leadership and loving nature instilled many values in me. I attended Fort Hill High School from 1966 to 1970. It was here that I met Colleen Burke, my English teacher, who played a significant role in my growth and development. There were many others that played an important role in who I am today. I am the perfect example of the old proverb : "It takes a Village to raise a child". I graduated in 1970 from Fort Hill High school and attended Allegany Community college that fall. The following year I attended the University of Maryland at College Park. I left the University of Maryland after a year and returned to Cumberland in the fall of 1972 where I was employed by the Kelly Springfield Tire Company in the radial truck tire dept. A year later I became an electrician apprentice. In 1976 I returned to Allegany Community College to pursue a degree in Business Admin. While attending college I became involved with the Black Student Alliance and was elected president for the spring of 1977. I was involved with Student Government Association and was elected vice president in the spring of 1977 for the upcoming school year. I graduated in 1978 with an Associates Degree in Business Administration. At that time I decided I would return the following year for some additional classes. I ran and was elected Student Government President. I served in this capacity for the school year 1978/79. I was hired at the Western Maryland Consortium in 1979 as an Independent Monitor. My duties included but were not limited to monitoring all programs under the Consortium's direction and insuring they followed all government rules and regulations. In 1980 I took the position Work Experience program director with the Consortium, a position I held until it was eliminated, due to government funding in the fall of 1981. I was hired in March 1982 as the store manager for Goodwill Industries. On May 19, 1982 I was hired by CSX Transportation in the Signal Dept. While employed at CSX I served in various positions including assistant signalman, signalman, lead signalman, & signal foreman. I was a foreman from 1994 until my retirement in November 2015. I also served in the positions of local chairman and president for my union, The Brotherhood of Railroad Signalman. I am the proud father of three children Eugene Frazier II (Geno), Bryon Frazier, & Jenae Frazier Farrell as well as 3 grandchildren Isaiah, Hayden, & Olivia Frazier. All but my daughter reside in Cumberland. I own 2 homes in Cumberland. 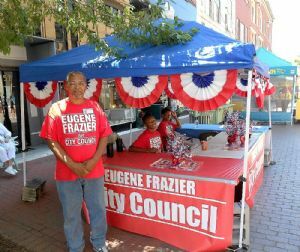 One on Rose Hill Ave that my son Geno resides in and another that I had built in 2013 on Lafayette Ave."
Campaign booth photograph taken on the Downtown Cumberland Mall during Heritage Days, 2016 by Albert L. Feldstein. Frazier is also noted elsewhere on this website as it pertains to the reorganization of the Allegany County Chapter of the National Association for the Advancement of Colored People (NAACP) in 1975 and as a member of the Fort Hill High School football team in 1967.